Here is layout #6 for next week... Sweet little Miss Kianna turned one and we had a bash.... and a bash it was! Poor little pumpkin wasn't feeling good but she did her best and made it a great party! SHe is such a happy little thing that when she is sick you are like 'really?' so not like her at all! By the time the cupcakes came out as long as she didn't have ten cameras in her face she was good! We had to be a bit sneaky about the pictures! 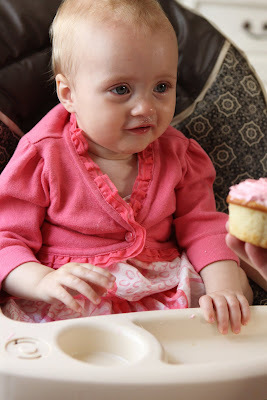 Once she got in to those cupcakes though there was no turning back, she loved them! Lynn, I love your work! We didn't have nearly enough time to visit at farm chicks. I am feeling totally inspired by you. Until we meet again, I will be checking on you here.